In the wake of the Cylon sneak attack, the ragtag fleet of human survivors is forced to play a deadly game of cat-and-mouse with their pursuers. Every 33 minutes, they make a jump to a new location. And every 33 minutes, the Cylons manage to find them. The pilots are on the brink of exhaustion, relying on artificial stimulants to keep fighting, and the civilians are beginning to doubt the leadership of Commander Adama and President Roslin. When the Olympic Carrier, a commercial passenger ship, fails to make a jump and then later mysteriously turns up unharmed, Adama fears it has been infiltrated by the Cylons. His choice: destroy it and the 1,300 souls it might still be carrying, or risk the annihilation of the entire fleet. Adama is not alone in fearing the mystery ship. Baltar, who remains mentally connected with his beautiful and deadly Cylon companion Number Six, panics when he learns one of the ship's passengers has information about a traitor in the president's inner circle. - Dee says, "Jump 237 underway. 53 ships have jumped. 10 still reporting trouble with their FTL drives, including Colonial One." But in the miniseries it was established that the fleet consists of about 40 FTL capable ships, not 60+. Could possibly some of the extra ships be accounted for by Galactica's raptors and other support ships? - What happened to the group of survivors Helo was with during the miniseries? - The shot used depicting the Galactica being nuked in the opening theme is a mirror image. - This episode won a Hugo Award for Best Dramatic Presentation, Short Form. - This episode received an Emmy nomination for Outstanding Special Visual Effects For A Series. - This episode received a Visual Effects Society nomination for Outstanding Performance by an Animated Character in a Live Action Broadcast Program. (Cylon Centurions). - Dee reports at one point that that 53 ships have jumped and that 10 are still reporting trouble with their FTL drives. This implies that there are at least 64 FTL capable ships in the fleet. - In season 1 as aired in the UK, the title sequence featured a Hindu mantra, the Gayatri Mantra, taken from the Rig Veda. The words from the mantra are: "OM bhūr bhuvah svah tat savitur varēnyam bhargō dēvasya dhīmahi dhiyō yō nah pracōdayāt" which roughly translates to: "May we attain that excellent glory of Savitri the Goddess / so May she stimulate our prayers." The US broadcast did not feature this until season 2. - Dee is from Sagittaron. - There are ~5251 survivors from Sagittaron. - At the beginning of this episode the official number of survivors was 50298, but Billy's statements about how there were "some over counts" make this number's accuracy questionable. - At the end of this episode the official number of survivors is 47273. - According to RDM, Edward James Olmos (Commander Adama) stayed awake for an absurd number of hours so that when he played his part in this episode that he'd look sufficiently realistically worn out and tired and that he convinced others among the cast to do the same thing. - Katee Sackhoff (Starbuck) fell asleep inside her Viper cockpit due to sleep deprivation while waiting to film a scene in this episode. - According to RDM, Edward James Olmos (Commander Adama) during the scene where he decides the pilots need to start taking stims just blurted out along with the list of nervous exhaustion cases that there were ten suicides. The writers loved the adlib, but ultimately decided that it couldn't make it into the final cut because it would have made the already super-dark episode too dark. - According to RDM, the scene in which Starbuck and Apollo are arguing over whether or not Starbuck should take stims wasn't scripted such that they suddenly started laughing about it, but it worked so well when the actors just started laughing at each other that they decided to run with that. - RDM wanted to make it clear that there were people on board the Olympic Carrier just before Apollo and Starbuck shot it down, so that it would be an emotionally stronger scene, but again, it was decided that that would have been a far too dark thing to do on an already very dark episode. However, although people were not obviously depicted, the visual effects people went ahead and included small signs of movement inside the ship which are very difficult to notice, but are indeed there. - Cally: "Why do the Cylons come every 33 minutes? Why isn't it 34 or 35?" Tyrol: "Cally." Cally: "What?" Tyrol: "Shut up." - The hallway with seemingly endless amounts of photos of missing people. - Six: "Procreation is one of god's commandments." - Roslin to Billy regarding Baltar: "He's a strange one, isn't he?" - Helo blowing up some Cylons. - The Olympic Carrier charging toward the fleet. - The Cylons appearing in the midst of the Olympic Carrier situation. 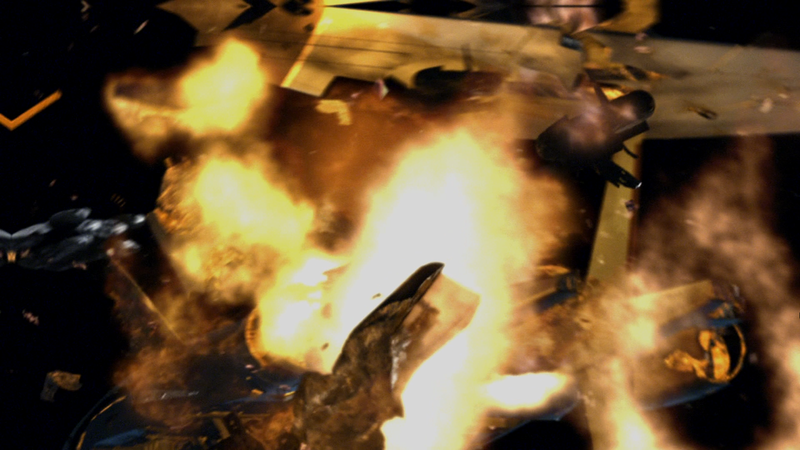 - Baltar's simultaneous repentance with Roslin's order to take out the Olympic Carrier. - Apollo and Starbuck destroying the Olympic Carrier. - Caprica Boomer shooting a Six model Cylon. - Billy informing Roslin of the birth of a baby within the fleet. The miniseries ends with something of a major cliffhanger revealing Boomer to be a Cylon and off the colonials go in a search for a fictitious Earth. Six said in the miniseries, "your escape is a temporary one at best," and this episode is true to her words. Immediately, right at the beginning of 33, we know some very bad things have been happening to the colonials. The Cylons had found them after only a short time and had been chasing them for nearly a week straight, jumping to their position every 33 minutes. What results is a story about an exhausted fleet fighting for their survival, jumping to a new location every 33 minutes, hoping they'll at some point lose the Cylons. Woven into the story are two other plot threads. One of them deals with Helo, who was left on Caprica during the miniseries and what he's doing to survive. We don't get to see a lot of Helo, but it seems clear the Cylons are herding him, or setting him up for something. He's manipulated into finding another copy of Boomer, who he thinks has returned to Caprica to rescue him. But why the Cylons are manipulating Helo in this way is not clear. The much more interesting and important story centers around Baltar, the Cylon god, Six, and the Olympic Carrier. The story leaves it wonderfully ambiguous as to whether or not these concepts are all connected or whether they are "coincidental, serendipitous events" as Baltar put it. But one thing is for sure, the Cylons are deeply religious in the monotheistic sense, and the Six in Baltar's head, whatever she is, wants to convert Baltar into believing in the Cylon god. Additionally, "procreation is one of god's commandments." Six wants to, somehow, have a baby with Baltar. Whether or not this is even possible and how it could be accomplished is unclear, but the Cylon religion and the Cylon desire for procreation appear to be major plot points to be developed in season 1. Wrapped around these concepts is of course the very real story of sacrificing the few to save the many, something the miniseries did extremely well. It's done nicely here too, but I'm irked that there was a sort of desensitizing done to the destruction of the Olympic Carrier. "It's okay to destroy it, it's got nobody aboard!" Making the Olympic Carrier a direct threat to the fleet using nukes was a great idea, but there should have absolutely most definitely been people on board that ship. Not only would the danger still be high from the nukes in this case, but the heart wrenching feeling of murdering the few to save the many would have been even more apparent, and it would have given the episode much more of an emotional punch. Overall, 33 is an incredibly strong start to the season. Just rewatching the series with my roommate (she's obsessed). They DEFINITELY needed people aboard the Olympic Carrier. Weak choice to totally show it as empty. At least put some mannequins or something in there so that you can't really tell. How many minutes can a Stargate stay open for?